Most people know that airline-affiliated cards provided certain benefits for those taking flights of particular carriers. This usually means a reduced (or no) checked baggage fee and some kind of priority boarding. This has become even more relevant as larger airlines are beginning to try to squeeze even more revenue out of their customers (Air Canada and Westjet, plus JetBlue, for example). So, it is nice when an extra benefit comes in handy. When my wife and I were traveling home from San Francisco recently we were late arriving to the airport so we didn’t have enough time to get sufficient food for the 5 hour journey. Instead, we relied on the food provided by JetBlue. It wasn’t just the free snacks that held us over, it was the tremendous amount of food in the Eat Up Boxes that gave us the meals that we wanted in-flight. 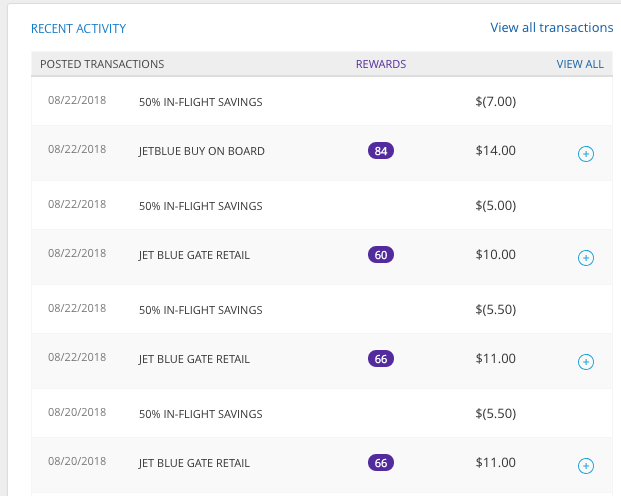 And, since we have the JetBlue Plus Mastercard, the costs was literally cut in half. As reflected on my most recent credit card statement, instead of spending $46 for this food (which would be a pretty absurd price), we spent $23 (something more reasonable). While I don’t want to rely on this in the future, it is nice to know that it is an option.